This terminology is based on parapsychological research, psychology, as well as other popular terms associated with ghost investigation. It is not meant to be a complete list of terms, but enough to create solid understanding as a researcher in these areas. Agent - (1) Person who attempts to communicate information to another in an ESP experiment. (2) The subject in a psychokinesis experiment. (3) Person who is the focus of poltergeist activity. Apophenia - Psychological phenomenon creating a significant image/event from a random one. Apport / Asport - An apport is a solid object that seemingly appears from nowhere in the presence of a medium. Asport is any object the spirits or medium makes disappear or teleports to another location. Astral body - The body a person seems to occupy during an out-of-body experience. Astral plane - A world some people believe exists above the physical world. Astral projection - An out-of-body experience. Astrology - A theory and practice which attempts to identify the ways in which astronomical events are correlated with events on earth. Aura - A field that some psychics see surrounding the living body. Automatic writing - Writing without being aware of the contents, as when a medium apparently transcribes written messages from disembodied spirits. Automatism - Any unconscious and spontaneous muscular movement caused by the spirits. (Automatic writing). Autoscopy - Seeing one's 'double', or looking back at one's own body from a position outside the body (OBE). Bilocation - Being (or appearing to be) in two different places at the same time (similar to autoscopy). Call - Response made by a subject in a card-guessing or other ESP test. Card Guessing - An experimental test for ESP in which subjects guess the identity of a set of cards. Cerebral Anoxia - Lack of oxygen to the brain, often causing sensory distortions and hallucinations. Sometimes used to explain features of the near-death experience. Channeling - The process by which a medium apparently allows a spirit to communicate through his or her person. Clairaudience - Auditory form of ESP (compare with Clairvoyance). Claircognizance - A subset of ESP and a form of clairvoyance where a person knows information without a logical explanation for why the know it. Clairgustance - A subset of ESP and a form of clairvoyance where a person has the ability of gathering information from taste without food or other objects in the mouth. Clairsentience - Physical sensations (or smell) form of ESP. Sometimes used as a general term for clairvoyance and clairaudience. Clairvoyance - A subset of ESP. The viewing of distant scenes not apparent to the eye, may appear externally - either replacing the normal visual scene (visions) or being incorporated into it (as could be the case with apparitions) - or internally, in the form of mental imagery and intuition. Cognitive interview - An interview technique that brings out more detail through a series of steps which causes the interviewee to become more descriptive and remember more details through psychological methods. Closed Deck - A set of cards used in a card-guessing test where each card appears a fixed number of times. Statistical analysis of research data using a closed deck differs from statistical analysis of data using an open-deck. Cold reading - A technique using a series of general statements, questions, and answers that allows fake mediums, mind-readers, and magicians to obtain previously unknown information about a person. (Reader has no prior knowledge). Collective apparition - An unusual type of ghost sighting in which more than one person sees the same phenomenon. Confabulation - A distortion of memory where gaps in the recollection of memories are filled in with fictional experiences. Control - In experimental parapsychology a procedure undertaken in order to ensure that the experiment is conducted in a standard fashion and so that results are not unduly influenced by extraneous factors. Control Group - A group of people whose performance is compared with that of experimental subjects. Correlation - An association between two or more events or variables. Correlation Coefficient - A mathematical index of the degree of association between two or more measures. Crisis apparition - An apparition seen when the subject is at the point of death or is the victim of a serious illness or injury. Cross-correspondences - Interrelated bits of information received from the spirit world by different mediums at different times and locations. The communications must be joined together to form a complete message from the spirit(s). DAT - Decision Augmentation Theory. An attempt to reconceptualize PK as a precognition-based selection process rather than one of actual influence. Deathbed Vision - A dying person receives a "visit" from a deceased family member just prior to their own death. Decline Effect - A decrease in performance on a psi test when the test is repeated. Déjà vu - The feeling of having experienced something before. Dice Test - Experimental techniques for investigating psychokinesis, in which a subject attempts to influence the fall of dice. Direct voice phenomenon (DVP) - A spirit voice, spoken directly to sitters at a seance. The sound usually seems to come from a point near the medium, or through a spirit horn or trumpet, but not from the mouth of the medium. Displacement - Responses on a psi test that correspond systematically to targets other than the intended one (those before or after). Dissociation - Activity performed outside of normal conscious awareness, or mental processes that suggest the existence of separate centers of consciousness. DMILS - Direct Mental Interaction with Living Systems. Used to denote instances where one person is attempting to influence a distant biological system, usually the physiology of another person. As it is unclear whether this represents an influence (PK), a case of ESP on the part of the influence, or an opportunistic selection process (see DAT), the term interaction has been adopted. Doppelganger - A mirror image or double of a person. Double Blind - An experimental procedure in which neither the subject nor experimenter is aware of key features of the experiment. Down Through Technique (DT) - An experimental test for clairvoyance in which the person guesses the order of a stacked series of target symbols (cards) from top to bottom. (opposite of up through technique). Electrodermal response - A measure of skin conductance or resistance related to sympathetic nervous system arousal. This response can be elicited by external stimuli (a light, tone etc. ), or by internal activity (e.g. emotions). Electroencephalograph (EEG) - A device that monitors the electrical activity of the brain over time by means of recording electrodes attached to the surface of the scalp. Electrohypersensitivity (EHS) - A condition in which EMF exposure causes hypersensitivity in a person. Symptoms of EHS include headache, fatigue, stress, sleep disturbances, anxiety (including a feeling of being watched), skin symptoms like prickling, burning sensations and rashes, pain and ache in muscles and many other health problems. EHS is debatable in science and while the symptoms are real many experts feel that EMF exposure is not a cause for these symptoms. Electrooculograhph (EOG) - A device that records eye movement. Empathy - Rarely used in modern parapsychology, the popular usage of this term refers to a low-level form of telepathy wherein the empath appears to be aware of the emotional state of a distant person. An empath may also be able to broadcast emotions to others. Empiricism - The premise that knowledge should be acquired through observation. ESP - Extrasensory perception. (receptive psychic) The ability to gain knowledge through means other than the five physical senses or logical inference. Evidence - Information or items that help to support a theory or conclusion. Electronic voice phenomenon (EVP) - The capture of spirit voices on magnetic tape as an audio recording. Many times, no sound is heard while the tape is recording. Its only upon playback that the harsh, hushed voices can be heard. In most cases this is a product of pareidolia. Experiment - A test carried out under controlled conditions. Experimental Group - A group of subjects who undergo a specific experimental procedure. Often results from this group are compared with those of a control group. Experimental Parapsychology - Parapsychology research involving experimental methods rather than survey techniques or the investigation of spontaneous cases. Experimenter - The person who conducts the experiment. Experimenter Effect - Influence that the experimenter's personality or behavior may have on the results of an experiment. False Awakening - An experience in which a person believes he or she has woken up, but actually is still dreaming. Folie à deux - A French term meaning, "A folly of two" where one person may influence another through excitement or other emotions. This is very typical in households dealing with ghosts where one person can influence the other or children influence the parents that the phenomenon is real. Forced choice experiment - An experiment in which the subject is forced to choose among an assortment of possible targets, such as the five ESP cards. Free response experiment - An experiment in which the subject knows only the general nature of the target - for instance, that it is a picture - but not anything else. Ganzfield experiment - An experiment where input from the outside world is reduced by placing halved ping-pong balls over the eyes and by masking external sounds (covering subject's ears with headphones and playing white noise). A state of mild sensory deprivation. General Extrasensory Perception (GESP) - ESP in which it is unclear whether the results are due to clairvoyance, telepathy, precognition or retrocognition. Ghost - A form of apparition, usually the visual appearance of a deceased humans spirit soul or that of a crisis apparition. Ghost hunt / Ghost (paranormal) investigation - A ghost hunt is an informal attempt to simply sight or record a ghost in a location similar to others known to be haunted. A ghost investigation, on the other hand, is a carefully controlled research project, set up to record paranormal activity, usually at a location known, or presumed to be haunted. Goat - A subject in an experiment who does not believe in the ability for which he or she is being tested. Group polarization - The tendency for groups to make decisions that are more extreme than that of any single individual member. These emotions can be gathered either in person or via social media and websites. Hallucination - Perception of sights, sounds, etc., that are not actually present. Ghosts, as we define them, are not hallucinations, because they have a real, external cause (although they do not represent physical bodies). Haunting - Recurrent sounds of human activity, sightings of apparitions, and other psychic phenomena, in a location when no one is there physically. Hit - A choice that proves correct. Hot Reading - A reading given in which prior knowledge of the sitter has been obtained, often using devious or fraudulent means. Hypnosis - State like sleep in which the subject acts only on external suggestion. Hypothesis - A suggested explanation for an observable phenomenon or prediction of a possible causal correlation among multiple phenomena. Incline Effect - An increase in performance on a psi test when the test is repeated. Intuition - The non-paranormal ability to grasp the elements of a situation or to draw conclusions about complex events in ways that go beyond a purely rational or intellectual analysis. Judge - Person who compares targets and responses in a psi experiment. Laying on of hands - A process by which certain healers profess to be able to heal patients by touch. Lens Flare - A camera anomaly that is created when non-image forming light enters the lens and subsequently hits the camera's film or digital sensor. Levitation - The lifting of physical objects by psychokinesis (PK). Life Review - Flashback memories of the whole of a person's life, often associated with the near-death experience. Longbody - A web of living connections among people, places, and objects. Lucid Dreaming - Dreaming in which the person is aware that the experience is a dream. Often associated with feelings of aliveness and freedom, and with the ability to control dream events. Magnetometer (EMF detector, gaussmeter) - A device to measure the presence of a magnetic field as well as its strength, direction, and fluctuation. Paranormal researchers use the device in an attempt to detect a ghosts magnetic or energy aura although no evidence has ever been created to support the hypothesis. Matrixing - A type of apophenia where the mind creates patterns in images and sounds that are merely random (animals in clouds, faces in random objects, hearing the phone ring while in the shower - when it actually doesn't- due to the pattern of water falling, etc.). The term pareidolia is a synonym. Mean Chance Expectation (MCE) - The most likely chance score in a psi test. Medium - A person who professes to be able to communicate with spirits. Medium (direct voice) - A trance medium who apparently acts as a transmitter for the voices of disembodied spirits. Medium (materialization) - A medium who seems to be able to give physical form to the deceased from a substance called ectoplasm. Medium (physical) - A medium who is the center of moving objects and other physical incidents supposedly caused by spirits. Mesmerism - The induction of a sleep or trance state, discovered during the work of Friedrich Anton Mesmer, from whose name the word is derived. Also known as hypnotism. Miss - A choice that proves incorrect. Mist - A photographed anomaly (not seen at time of photo) that appears as a 'blanket' of light. Theory suggests that this is the appearance of a 'ghost' or 'spirit' of the dead. As with other photographed anomalies there is environmental issues that are of concern to the validity of their existence (moisture, reflection, dirty lens, etc.). There has been no substantial proof that these are, or are related in any way, to 'ghosts' or paranormal behavior. Motor automatism - Bodily movement of an intelligent and purposeful kind of which the person is not aware, as with automatic writing. Necromancy / necromancer - A form of prophecy, in which the seer or sorcerer / sorceress raises the spirit (not corporal remains) of the dead in order to have the wraith foretell future events. It was thought that upon entering eternity, the spirit would have full knowledge of the past, present, and future. NDE - Near-death experience - the out-of-body and other experiences people report having when they are close to death. Events within NDE include: an OBE, life review, a tunnel experience (drifting in darkness), encounters with guides (or angels), seeing dead relatives or friends, a moment of decision (or being told) to turn back. Noise-reduction model - The idea that psi information may be more accessible if normal sensory information is reduced to a minimum (reducing sensory noise to make the psi signal clearer) (see Ganzfield experiment). OBE - Out-of-body experience - the experience that the self is in a different location than the physical body. Objective apparitions - Apparitions or phenomena that appear independent of our minds, thoughts, or feelings. Occam's Razor - The principle that we should always prefer the simplest explanation of events. Open Deck - A series of cards used in a card guessing test where each card is chosen randomly and independently. This enables each target to be selected any number of times. Statistical analysis of research data using an open deck differs from statistical analysis of data using a closed deck. Open Matching (OM) - A card guessing procedure in which key cards are placed face up on the table. The subject then places the unseen target cards in piles in front of each key card, according to their guesses. Orb - A photographed (not seen at time of photo) anomaly that, in theory, represents an ongoing 'spirit' of a deceased person. It appears as a ball of light and may occasionally seem to be moving. This is a highly controversial subject since there are many reasonable circumstances that identify this as environmental (dust, rain, snow, dirty lens, insects, reflection, lens flare etc.). There has been no substantial proof that the balls of light are associated with 'ghosts', the dead or any paranormal behavior. Ouija Board - A board pre-printed with letters, numerals, and words used by mediums to receive spirit communications. Usually a planchatte (palm-sized triangular platform) is employed to spell out words or point out numbers or letters. A game version of the Ouija board was mass-marketed as OUIJA by Parker Brothers in 1966 and is currently distributed by Hasbro. Paranormal - Above or outside the natural order of things as presently understood. Pareidolia - A type of apophenia where the mind creates patterns in images and sounds that are merely random (animals in clouds, faces in random objects, hearing the phone ring while in the shower - when it actually doesn't- due to the pattern of water falling, etc.). The term matrixing is a synonym. Percipient - A person who sees (i.e., perceives) an apparition or ghost. Phenomenology - An approach to research that aims to describe and clarify a person's own experience and understanding of an event or phenomenon. Poltergeist - A German word meaning 'noisy or rowdy ghost' (see also RSPK). Precognition - The ability to predict things beyond present knowledge. Probability - The likelihood that results in a test were due to chance. Process Research - Research that aims to investigate factors affecting psi. Proof - A set of evidence that provides validation on a particular theory. Proof Research - Research that aims to demonstrate the existence of psi. Psychical Research - Term coined in the late 19th century to refer to the scientific study of the paranormal. Now largely superseded by 'parapsychology'. PK - Psychokinesis - (expressive psychic) the power of the mind to affect matter without physical contact. PK (bio) - Psychokinetic influence of biological systems e.g. changing the physiological activity of a living system (see DMILS). PK (deliberate) - Psychokinesis that occurs as a result of conscious effort by the person causing it. PK (macro) - The effect of psychokinesis on objects in general. PK (micro) - The effect of psychokinesis on random events such as random event generators (REGs). PK (spontaneous) - Psychokinesis that occurs without conscious effort by the person who causes it. PK (time-displaced) - The concept of psychokinesis going backward in time to affect events that have already taken place. Psi - A letter in the Greek alphabet that denotes psychic phenomena. Psi hitting - A test performance significantly higher than expected by chance. Psi missing - A test performance significantly lower than expected by chance. Psyche - The Greek word for self, mind, or soul. Psychic - A person with above average ESP abilities. Psychic healing - A mode of healing affected by the psychic abilities of the healer. Psychic surgery - The supposed ability to paranormally perform invasive surgery using no conventional medical tools. Psychometry - ESP of events associated with inanimate objects. Radio voice phenomenon (RVP) - Receiving the voice of a deceased human being over a regular radio. An overwhelming majority of these instances are pareidolia. Remote viewing - (1)Another term for clairvoyance. (2)An ESP procedure in which a percipient attempts to become aware psychically of the experience of an agent who is at a distant, unknown target location. REMs - Rapid eye movement during sleep that indicates dreaming. Repressed psychokinetic energy - A theoretical psychic force produced, usually unconsciously, by an individual undergoing physical or mental trauma. When released, the power causes paranormal occurrences such as poltergeist activity. Response - An action made by a subject in an experiment. Response bias - Tendency of a subject to prefer particular responses. Retroactive Psychokinesis - Paranormal influence that an agent can have on an experiment after it has been completed. RSPK - Recurrent spontaneous psychokinesis. A possible cause of apparent poltergeist activity. Run - A set of trials in a psi test. Sceptic (skeptic) - A person inclined to discount the reality of the paranormal and to be critical of parapsychological research. Generally seeks rational or scientific explanations for the phenomenon studied by parapsychologists. Score - Number of hits in a psi test. Scrying - A term used to cover a wide range of divination techniques which parapsychology would tend to classify as types of ESP. Most scrying techniques involve some degree of fixation on a surface with a clear optical depth (crystal ball, a pool of ink or deep water) or on an area which shows random patterns (flames in a fire, smoke), the idea being that subconscious information available to the scrying will be manifested in their interpretation of the imagery or random patterns they see. Séance - A group of people who gather in an effort to communicate with the dead. Series - A sequence of runs in a psi experiment. Shaman - A wizard in tribal societies who is an intermediary between the living, the dead, and the gods. Shared Death Experience - A living person experiences another's death or dying experience or is able to sense the death process of the person. The living person's experience is similar to that of a near death experience (seeing white light, tunnel, loved ones, etc.) or can be an out of body experience where they participate in a "life review" of the dying person, or they can even witness a person's "spirit" leaving their body to anything else in-between. Sheep - A subject in an experiment who believes in the ability for which he or she is being tested. Simulacrum - In the context of apophenia, this is the image or representation or the apophenia / pareidolia; in other words it is the item that is causing the misinterpretation. Spirit photography - A spirit photograph captures the image of a ghost on film. Many of these are supposedly intended as a mere portrait of a living human being, but when the film is developed, an ethereal ghostly face or figure can be seen hovering near the subject. This may also incorporate orbs, vortexes, and mists to some degree. An overwhelming majority of these photos are created fraudulently through double exposure. Spirit theater - A term used by modern-day magicians to describe shows, acts, or tricks in which ghosts or other spirit activity are apparently produced. Spiritualism - A belief system that spirits of the dead can (and do) communicate with living humans in the material world. (Usually through a intermediary known as a medium). Subjective apparitions - Apparitions or phenomena that are hallucinations created by our minds. Supernatural - Something that exists or occurs through some means other than any known force in nature. As opposed to paranormal, the term supernatural often connotes divine or demonic intervention. Statistics - Mathematical techniques for analyzing and interpreting data. Synchronicity - A coincidental event that has specific meaning. These events are typically misjudged using "selection fallacy" where we assume this random event is a message, has hidden meaning, or has been sent by an intelligent force outside the living. Target object - In ESP, the object or event the subject attempts to perceive; in PK, the object or event the subject attempts to influence. Telekinesis - Paranormal movement of objects. Telepathy - The direct passing of information from one mind to another. Teleportation - A kind of paranormal transportation in which an object is moved from one distinct location to another, often through a solid object such as a wall. Theory - In science, a theory is a well-substantiated, unifying explanation for a set of verified, proven hypotheses. Thought form - An apparition produced by the power of the human mind. Trance - A sleeplike state in which there is a change of consciousness. Trial - In psi tests, a single attempt to demonstrate paranormal ability (e.g., one attempt to guess a card or one attempt to influence the fall of the dice). Up Through Technique - An experimental test for clairvoyance in which the subject guesses the order of a stacked series of target symbols (cards) from bottom to top. Vortex (vortice) - A photographed anomaly that appears as a funnel or rope-like image (sometimes creating a shadow) that is not seen at the time of the photograph that supposedly represents a 'ghost'. Other theories include; a collection of orbs, a 'gateway' to where orbs originate or travel to or a wormhole in time-space. No substantial evidence has been found for any of these theories. White noise - A hiss-like sound, formed by compiling all audible frequencies (used in Ganzfield experiments). Zener Cards - Set of 25 cards (5 each of circle, square, Greek cross, five-pointed star, three wavy lines) designed by the perceptual psychologist Karl Zener for use in card-guessing tests of ESP. (also known as ESP cards). This by no means is a complete dictionary of terminology. This is meant to provide you with pertinent words to aid in the basic understanding of parapsychology and the ghost hunting world. Do not copy or post any of this material by any means without prior written permission from Brian D. Parsons via the Contact page. Information for this glossary taken from Michael Daniels, PhD., Psychic Connections: A Journey Into the Mysterious World of Psi by Lois Duncan and William Roll, PhD. (Bantam Doubleday Dell Books, 1995), The Complete Idiot's Guide to Ghosts and Hauntings by Tom Ogden (Alpha Books 1999), Psychology Themes and Variations second edition Wayne Weiten (Brooks/Cole Publishing 1989), Cambridge in Color, and Hypothesis Versus Theory on Diffen, and The Science of Ghosts by Joe Nickell (Promethius Books, New York, 2012). 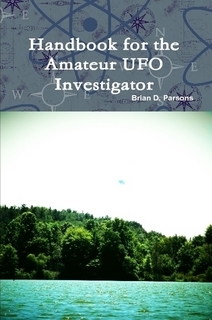 Handbook for the Amateur UFO Investigator was released in 2017 and focuses on the cultural and historical references behind UFOs while providing the reader with a solid understanding of interviewing methods as well as onsite investigation and offsite research techniques and observations. 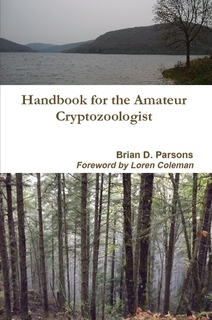 Handbook for the Amateur Cryptozoologist was released in 2014 and deals with a balanced look at the investigation of unknown or undiscovered animals. A Second Edition was released in 2015 which included a foreword by cryptozoologist Loren Coleman. 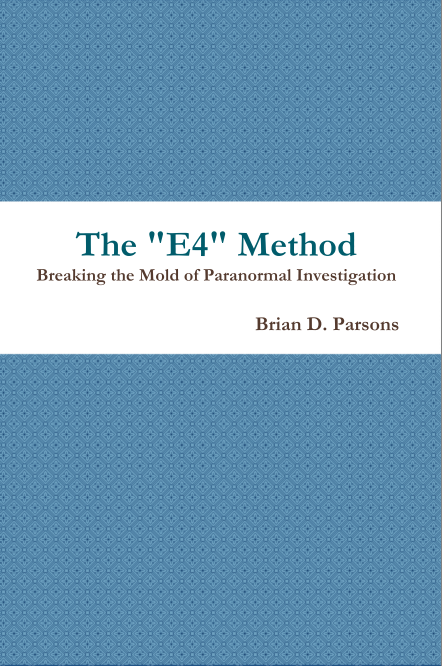 The "E4" Method: Breaking the Mold of Paranormal Investigation released in 2013 is based on the new client-based investigation methodology created by Brian D. Parsons. 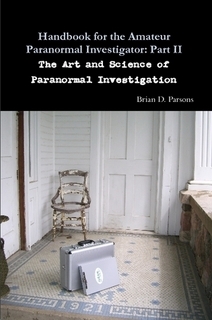 The Handbook for the Amateur Paranormal Investigator Part II: The Art and Science of Paranormal Investigation is geared toward those who know the basics beyond what is portrayed on television and the Internet. This next chapter in the handbook series takes a step forward into the world of client-centered paranormal investigations. 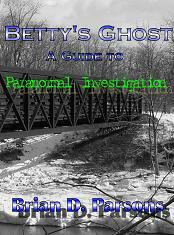 Betty's Ghost: A Guide to Paranormal Investigation is a companion book to the first handbook and is an over-the-shoulder look at how an investigation is approached step-by-step. 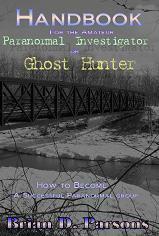 Handbook for the Amateur Ghost Hunter or Paranormal Investigator: How to Become a Successful Paranormal Group was released in May of 2008 and looks at the basics of operating a paranormal investigation group.